Does the Emperor have any clothes? New Zealand academics, researchers and virtual world builders, using and testing the alpha phase of the New Zealand Virtual Grid (NZVWG), no longer have to look like ‘noobs’ even though given some of the vagaries of the OpenSim environment they might sometimes feel like that. Open source avatar skins, eyes, hair and clothing have now been made freely available on the Auckland portal of NZVWG at Kapua 6 (NZVWG Kapua 6/88/116/34), and are likely to be made available near the Auckland entry point to the MUVE on Kapua 3 as well as at other Portal entry points. The full permissions skins have been created by the likes of Eloh Eliot, Ziah Li, Greybeard Thinker and others, with the clothing obtained from a variety of sources outside the Second Life environment, such as free, full permission listings of clothing textures. All are being made available under “Attribution-Share Alike 3.0 Unported” Creative Commons licenses. The NZVWG Project which grew out of Otago University’s ONGENS programme is a joint venture of the University of Auckland, the University of Otago the University of Canterbury and the Wellington Institute of Technology, Weltech. A number of other institutions both in New Zealand and oversea have expressed interest in the project which is supported by New Zealand Telecom. It is an open access national virtual world grid based on open source software. It operates on NZ-based servers hosted at Otago, Auckland and Canterbury Universities, and leverages other national investments in IT infrastructure through deployment on the high-speed KAREN (Kiwi Advanced Research and Education Network). The grid has been set up with an academic focus and will be used for research and education, as well as for proof-of-concept application deployments and testing. The project, based on opensource OpenSim technology, is being led by one of New Zealand’s foremost virtual world education champions, Dr Scott Diener, an academic and Associate Director, AC Tech, Information Technology Services, at the University of Auckland. Diener is well-known, both as himself and as his Second Life personna, Professor Noarlunga, in MUVE education circles around the world for his development of medical simulations and teaching programmes within Second Life. Although little educational research is currently being done in the alpha test phase of the NZVWGrid there are opportunities once testing is completed. Besides Diener’s Second Life University of Auckland virtual medical centre project in Second Life, which may migrate to the NZVWG, Otago University has set up the Otago Virtual Hospital in NZVWG (OtagoMedicalSchool/162/99/2800) and is also hosting scenarios for medical students to gain experience practicing as doctors. Some members of the now completed SLENZ Project are also active in the NZVWG although there are no plans at this stage for a sequel to that successful research project. and a limited range of footwear. Sign of the ONGENS times … The Kiwi Tavern at Port Cook. Even though the New Zealand National Virtual World Grid appears to be going through a difficult and, at times, fragile gestation, there is a small band of enthusiasts who are willing to put up with the frustrations of working in an Alpha test world to ensure that the ONGENS Grid moves through Beta on into a full-blown phase which will allow productive education research and possibly hypergrid access to other open-source, OpenSimulator virtual worlds. One of those enthusiasts is Auckland University academic Dr Scott Diener who “shouted” the first “drinks” – a tankard of Kiwi ale – to virtual world builder Cira Emor, who is re-creating the build of a log cabin(piece by piece! ), and your’s truely Johnnie Wendt, who is creating a beachside “slum”, Arcadia Asylum Memorial City, with a little bit of help from the creations of the late and much lamented Second life “artist” Arcadia Asylum. Besides its two regions, soon to be three, in Second Life, the University of Auckland has something like 12 regions on the ONGENS Grid, some named Kapua (a small cloud) keeping with the university’s virtual world Second Life theme of Long White Cloud or Aotearoa. As well as constructing Port Cook – it is still in the ongoing construction phase – Scott (SL :Professor Noaralunga) has also opened up two storefronts under the buildings which are giving away “freebies” such as office and home furnishings. Another has been allocated for the supply of freebie textures, to be stocked in cargo boxes. Johnnie Wendt, Scott Diener (pink shirt) and Cira Emor at the Kiwi Tavern. Designed primarily for research into the benefits of virtual world education and Web3D technology the ONGENS Virtual World Grid, within the ONGENS (Otago Next Generation Networks and Services) Test Bed Project, championed by Dr Melanie Middlemiss of Otago University, is a joint project on which the Universities of Canterbury and Otago and part of the GNI (Global Network Interconnectivity) Project, The GNI Project has been designed to develop research, enterprise training, and knowledge sharing activities to support new ICT technologies, such as JAIN SLEE, on the way to telecommunications, multimedia, and information systems convergence. It is funded by the New Zealand Tertiary Education Commission Growth and Innovation Pilot Initiative (The SLENZ Project is also funded by TEC). One of the ONGENS residents, Wendy Steeplechase, at the Port Cook furniture store. Since the launch of the grid Canterbury and Otago have been joined by the University of Auckland and WelTec, each with a node and regions within the ONGENS Grid. Students from WelTech have already used the grid for real world learning projects. The grid is currently running on OpenSimulator software, and utilises the high-speed KAREN (Kiwi Advanced Research and Education Network) connectivity between New Zealand’s tertiary institutions, and research organisations as well as public Broadband. The attractive stone buildings in Port Cook – the tunnel leads through a forest to a castle. THE ONGENS team plans to develop the ONGENS Grid into a New Zealand National Virtual World Grid initiative, and is currently seeking funding and expressions of interest for involvement in the project. Meanwhile in a related project, an Otago Open Source Software Initiative has been set up by Otago University’s Department of Information Science to provide advice and support to schools and small-medium sized businesses (SMEs) in New Zealand on a range of open-source software technologies that have the potential to reduce IT operational costs, leverage productivity and enable companies to “work smarter”. “The main issue holding back schools and small businesses from moving to open-source solutions on the desktop is the often limited support and documentation that makes much open-source software a difficult proposition to maintain and manage,” a spokesperson said. “This lack of documentation and support often results in the running cost of open-source software, i.e. the costs associated with lost productivity due to downtime and the cost of in-house technical-staff time required to support the software, quickly outstripping the initial purchase price of a commercial alternative. “It is this situation that has lead the Department of Information Science to establish the Open Source Software Initiative to support the take up of open source software by schools and SMEs by using its expertise to develop standardised, tested software bundles that “work” and to provide a support forum with “expert advisers” to assist in the identification of appropriate open-source solutions,” the spokesperson said. CAN NEW ZEALAND USE THIS LESSON? The New Zealand tertiary education system should probably be looking at following the virtual lead of the University of Texas, although perhaps not on a such a grand scale. At the same time the New Zealand tertiary education system remains at the stage of “toe-dabbling” with the arguably successful SLENZ Project slated to finish at the end of the year and the OpenSim ONGENS New Zealand National Grid Project simmering – one might unkindly say bumbling – along in Alpha mode with inadequate funding and resources despite a small band of hard-working devotees doing their best to create a homegrown virtual world and build support across the whole New Zealand university spectrum. But despite some tardiness here all is not lost. 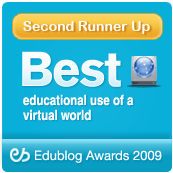 The UT research into virtual world education is to be made freely available to educators/researchers around the world and there will be opportunities for collaboration with the UT campuses, something New Zealand educators should look into. The University of Texas’ Dr Leslie Jarmon (pictured right), Faculty Development Specialist and Senior Lecturer in the Division of Instructional Innovation & Assessment (CIE/DIIA), at the University of Texas, at Austin, co-founder of the Educators Coop in SL, and the primary investigator for this statewide initiative, told Linden Labs’ John Lester that the the biggest challenge to gaining approval for the initial one-year, 50-plus-SL region launch of the project had been finding the most effective language and concrete Second Life examples to craft a proposal that would be heard by key administrators. Another key challenge, she said, had been rigorously ensuring that the provision of the virtual infrastructure for 15 campuses (9 academic campuses; 6 medical health science center campuses) and information and training support would not dictate which direction each campus would take as they discovered and created their own unique learning and research journeys. An invitation has been issued by Melanie Middlemiss to the GNI Project Symposium ’09 to be held from 8.30 am – 5 pm on Friday, September 4, 2009, at the School of Business, University of Otago, Dunedin, New Zealand. Online Registration is free but must be completed before 5pm, Friday, August 14. The one day symposium has been designed to bring together academic and telecommunications and internet industry leaders to discuss current and future issues relating to convergence in the ICT and Telecommunications arena. The Global Network Interconnectivity (GNI) Project was established at the University of Otago in 2006 to develop expertise, provide knowledge sharing and conduct activities supporting new ICT technologies that contribute to telecommunications, multimedia, and information systems convergence. The Project currently runs the alpha release virtual world Grid ONGENS. This is an experimental Grid set up in the ONGENS Test Bed Facility between Otago University and Canterbury University to explore the possibilities of Virtual Worlds and Web3.D technology. This grid is currently running the OpenSimulator software, and utilises the high-speed KAREN (Kiwi Advanced Research and Education Network) connectivity between New Zealand’s tertiary institutions, and research organisations. The GNI Project plans to develop this Virtual World Grid into a New Zealand National Virtual World Grid initiative, and is seeking funding and expressions of interest to be involved in this project. The New Zealand Teaching and Learning Conference and eFest are joining forces for 2009. The combined conference will held Wednesday, September 30 – Friday, October 2, 2009 at UCOL in Palmerston North, New Zealand. It will have an “Open Space” unconference day on Tuesday, September 29. The conference themes are “Teaching excellence – excellence in teaching” and “The changing role of the teacher in the 21st century”. Speakers at the conference proper are scheduled to include Dr Angie Farrow (pictured left), a senior lecturer at Massey University, New Zealand specialising in drama and creative processes, and a playwright, Colin Cox, Colin Cox, currently the only Master Trainer of Neuro Semantics in the world, Helen McPhun, a learning and development specialist, Dr Lisa Emerson, a Massey University lecturer and recipient of a Prime Minister’s Supreme Award in 2008 and Paul McElroy, chief executive at UCOL. The two principal sponsors are: Ako Aotearoa, the National Centre for Tertiary Teaching Excellence, and UCOL. You can download the registration form here. Researchers at the University of Illinois at Chicago (UIC) School of Public Health have secured a grant of US$1.6 million to fund a study to determine if collaborative virtual environments designed to improve public health preparedness and response planning really work. The school which is relying more and more on virtual environments for training and education has received the grant from the US Center for Disease Control and Prevention. The results should be of interest to health educators worldwide given the number of Second Life health applications, including New Zealand’s own midwifery pilot study under the auspices of the SLENZ Project and Auckland University’s Second Life and ONGENS medical centres. Under the programme, according to Virtual World News, UIC researchers will recruit 40 local health departments from across the United States to take part in the study. Half the participants will use Second Life to train public health workers in emergency preparedness while the other half will use a traditional meeting approach to planning. Three major New Zealand universities are planning to establish an open-access, open-source New Zealand National Virtual World grid based on the ONGENS OpenSim grid which is currently under development. The universities are Otago University, the University of Canterbury, and the University of Auckland. They have been joined by Telecom in the proposed establishment of the grid which will operate on New Zealand-based servers and will leverage other national investments in IT infrastructure. Funding is currently being sought to support this initiative. Although the NZVWG will be primarily for research and education it will also offer proof-of-concept application deployments and testing. It is being designed to provide both experimental and routine use of VWs in teaching and research; to develop engaging interactive in-world content customised for New Zealand use; and to develop new context-specific plug-ins, enabling interaction between virtual and real (non-virtual) worlds. The announcement of the planned NZVWG was made by Dr Melanie Middlemiss, manager of the GNI Project, from which the ONGENS testbed originated and which she runs with GNI technical manager Ms Hailing Situ. The developmental ONGENS Grid, set up in the ONGENS Test Bed Facility developed by Otago University and Canterbury University to explore the possibilities of Virtual Worlds and Web3.D technology, already has nodes run by the University of Auckland, the University of Canterbury and Weltec. It currently is “open” for avatar registration but because it is in the developmental phase is not as stable as some other virtual worlds. It has about 100 registered users. ONGENS uses both the Government-funded KAREN (Kiwi Advanced Research and Education Network) system and local networks. Otago, Canterbury and Auckland Universities along with Telecom have formed a Governance Board for the NZVWG. The proposed NZVWG will be composed of individual nodes at each University, connected together. The project has been described as ” exciting” by the University of Auckland’s associate director, IT Services, Scott Diener, who is well known for his championing of virtual world education. The university, which has a two-sim presence in Second Life, is currently is running full test and development servers, hosting 12 islands on the ONGENS grid. Announcing that further funding was being sought, Dr Middlemiss, said it was hoped to get more New Zealand and Pacific universities involved – the University of Papua New Guinea already has a research site – but it was a matter of finding people who were enthusiastic and dedicated to the development of the NZVWG. Meanwhile the Government announced as part of the 2009 Budget in May a NZ$16m investment in KAREN to support the organisation’s ongoing operation and transition to a self-funding model.